Today is the Marin TweetUp at Wipe Out Marin in Bon Air. I’m really excited about this TweetUp because I’ve been thinking about trying Wipe Out Marin for quite some time and just haven’t yet. Thanks to the TweetUp I will. Wipe Out has always attracted me because it reminds me of Southern California where I grew up. From the outside it looks like a fun kind of restaurant you would see on a white sandy beach. The kind you would want to sit down at and stay for awhile. Besides I love supporting business that get the importance of social media and appreciate the Twitter community. I’m looking forward to seeing my favorite Twitter friends and to meeting new ones. If you happen to be nearby today between 4-6pm please stop by to say hi. Wipe Out Marin will donate 20% of all TweetUp proceeds to Haiti relief today. Click here to view directions to Wipe Out in Marin. TweetUp is from 4-6pm today, 2/2/10. Special thanks to @PoButler for coordinating this TweetUp with @WipeOutMarin. 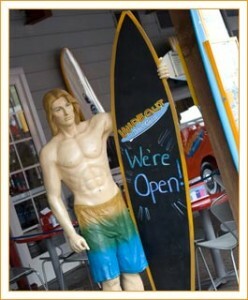 Photo of studly surfer dude borrowed from the Wipe Out Marin Website.